We invite you to experience World Class hunting for Desert Mule Deer, Coues & Whitetail Deer. Our Sonora desert Hunting Headquarters has long been famous for record class Desert Mule Deer and Coues Deer. There are also offer excellent Gould's Turkey and Cougar (Mountain Lion) hunting opportunities. Our Hunting areas boast outstanding hunting opportunities. Hunting is done in late December and January, which is the peak of the rut. We have experienced guides, and expert trophy care. Airport reception by our professional hunting staff. Round trip transportation to hunting and from our hunting areas. Lodging and meals are provide in our comfortable ranch house. We provide a guide for each hunter (unless you request otherwise). All soft drinks and beer is included in our pricing. We field dress and cape your buck for you. All transportation is provided on our hunts. We provide delivery of your trophy buck to a "local" taxidermist or airport in Hermosillo. A full professional staff is on hand to attend to your needs, both in the field, and at the camp. On your hunting trip you have the possibility to see: Trophy Mule Deer, Coues Deer, Javelin, Bob Cat, Cougar, Coati, Coyote, Gould's Turkey, Whitetail Deer and small game. Please feel free to contact Shan Skipper - 361.655.0220 for any questions. We are confident you will experience one of the best hunts of your lifetime, just as many past hunters have. Ask your travel agent to book you to Hermosillo Sonora, Mexico International airport, where you will be met by our professional hunting staff and transported to the lodge. AeroMexico and US Airways have daily direct nonstop daily flights flights from Phoenix or Tucson directly to Hermosillo, Mexico. When you arrive at the airport in Hermosillo you will be greeted by Mexico Deer.com hunting staff, assisted through customs and immigration and cleared for entry into Mexico with your guns. All hunting properties can be reached by vehicle in under two and half hours. You will spend the rest of the day getting ready for the hunt and sighting in your rifle. Depending on arrival time, you may be able to take in a hunt the first evening. All licenses, gun permits, game camping, preparing skin for mounting and paperwork for returning to the states are taken care of by Mexico Deer.com hunting staff. If you wish to fly to the hunting area please make arrangements with your travel agent or airport office in Hermosillo, Sonora. We will make every effort to provide you with the highest quality hunt possible. This is not a guaranteed hunt. You may go home empty handed. If the game( sheep, mule deer, coues deer, cougar, javelina, etc. ) is wounded, (i.e. blood, hair, meat, or bone is found), the hunt is restricted to the animal shot. If not found, the hunter must still pay the appropriate kill fees. We will make every effort within reasonable time to locate a wounded animal. Due to fluctuations in temperature, we recommend a down jacket for early mornings and evening and light clothing for midday. Two pairs of well worn walking boots and 3 changes of clothing should be sufficient and a peaked cap or hat is a must. It is recommended that you bring your own weapons. Weapons are inspected upon entry at the airport and you will be issued a temporary local license. Please ensure that you receive a valid customs declaration form from customs in your own country to ensure re-importation of weapons on your return. Have all your firearms serial numbers at hand to avoid problems at customs. Two color passport size photographs. Two colored copies of your passport and driver's license. The filled out contract with your signature. The confirmation of your deposit. Please read and fill out mutual agreement. Your hunting guide representative (Shan Skipper) will collect the above information from you. You will need to provide your above personal information to our office 90 days prior to your hunt so we may obtain the necessary permits. A 50% reservation deposit is required at booking date, the rest must be paid at least 60 days prior to hunt scheduled date. Please feel free to contact Shan Skipper - 361.655.0220 for any questions. Safety notice/ disclaimer - The area where you will hunt these big game trophies may be rugged and big game hunting is a potentially hazardous sport and while all reasonable precautions are taken to ensure the safety of our clients we cannot be held responsible for any illness, or accident while on your hunt. We are not responsible for lost nor delayed luggage nor weapons during your travel. When making your air travel reservations, please make sure there is enough time between one departure and the next. It is common that sometimes your luggage can be separated from you. By this happening, makes you lose one day of hunting, while trying to recuperate your luggage. These extra travels from the hunting area and the airport are an extra expense that is not included in our package. 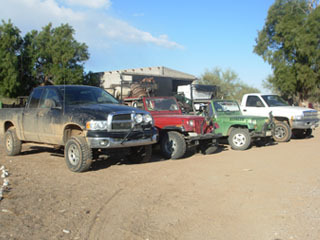 Hunting in Mexico for Trophy Whitetail & Mule Deer in Sonora, Mexico. Call (361)655.0220 to book your Mexico Hunting Trip.